Fork Truck Accidents: Statistics, Videos and Pictures - Be Certified Today! Fork truck is very useful piece of mobile equipment that can easily get the job done in no time. Forklifts can weigh up to 9,000 pounds and carry weight up to twice of its own weight. Because of its characteristic of being mobile and heavy, it can post serious danger if driven unsafely and improperly. Forklift operators are required to complete the training prior to commencement of operation. OSHA has been very stern about the implementation of its latest OSHA 1910.178 standard for the prevention of industrial fork truck accidents. We've prepared this article to teach how you can mitigate the risks of an accident by giving your advices and showing some of the videos and photos to learn lessons from. The objective of every training course is to make forklift operators understand how forklift works and driven properly, operate this mobile equipment safely, securely and skillfully, to make operators aware of the workplace and machine-related risks and hazards, to apply and implement the general principles of forklift safe operational procedure, suitable and correct inspection prior to work commencement and proper maintenance of the forklift. Some of the reasons of workplace accidents involving pedestrians are operator’s obstructed view of the surroundings. This may be caused by the bulk of the load being transported, operator must take precaution that when transporting large loads it is better to have several trips than to load all of them at one time. Turning and maneuvering are oftentimes taken for granted as simple operation. Many operators ignore proper maneuvering so that they can only take up much lesser space when doing maneuvers or turning. They ignore the things behind until they struck it and cause serious accident or property damage. Always look behind and at the sides when turning. The most important aspect of installation of traffic signage is to make other workers in the workplace be aware that forklift operation is in progress. Signage also gets them informed that the path they are taking are the same route where forklifts are passing. Horse playing and carrying of passengers is a recipe for disaster. Incidents like these happen during break times. Though, some incidents happen during busy operation especially when workers ask the operators to take them to destination. Never let them ride the truck, truck is only intended for operator inside the case, no one else is allowed. Why placement and implementation of forklift safety training is significant for the safe business operation? Well, as the statistics tells us, forklift operation when handled improperly can become a very big danger to the welfare and lives of the workers. According to BLS injury statistics, lift truck related accidents are the causes of more than one hundred deaths and fatalities each year, more than twenty five thousand lost workday injuries each year. Forklift accident report in the United States: that one for every six workplace deaths are forklift related. 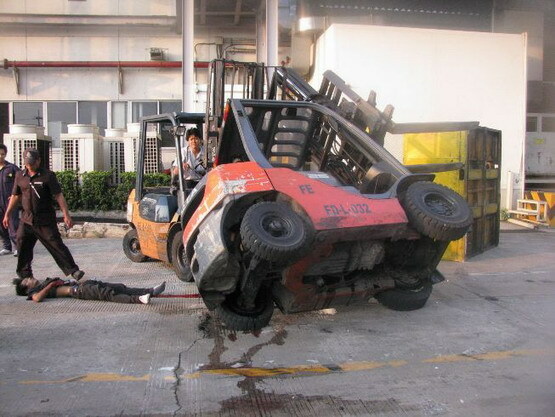 There are 110,000 major forklift accidents happened each year. It costs business and employers around $135,000,000 loss. Over 11% of the total number of forklifts being operated will be involved in an accident. More than 80% of accident involved pedestrian or people around in the workplace not directly involved in its operation. Manufacturing industry contributes to around 42% of the accidents, construction is the second with 24%, whole sales trades contribute 12%, transportation sector is 11%, retail trade is 9%, and mining is 1%. With the overall number of industrial accidents, only 3% of forklift operators under the age of 20 are involved in accidents. 20-24 years old contributes to 10%, 25-34 years old is 22%, 45-54 is 21%, 56-64 is 12%, and 65 years old and older is 5%. The most common accident is hitting a pedestrian during crossing. This is very common occurrence in the workplace especially when there are not traffic signs installed. Tipping over can also account as the second common accident. This is when forklift operator miscalculated the maximum capacity of the truck being driven, remember that the maximum capacity can be checked in the name place attached to the forklift. Improper positioning of the materials and loads being transported can also cause accident. Operator must ensure that positioning is balance and exact. The other cause of serious accident is when worker stand on the fork to raise him up, this is a big no-no, but this type of behavior can be commonly observed or reported in many workplaces. Falling from height at elevated forks accounts also as one of the reasons of serious injury. Forklift truck accidents can happen anytime, it can change the lives of worker or end it. Businesses and employers must provide effective measures to lessen the risk, mitigate the danger and tone down the menace. Employer can implement a safety training program. Hire or designate someone as trainer, create training suitable training course, train the operators periodically, conduct refresher courses when needed, maintain training record to monitor the progress or advancement and most of all stay to become OSHA compliant.